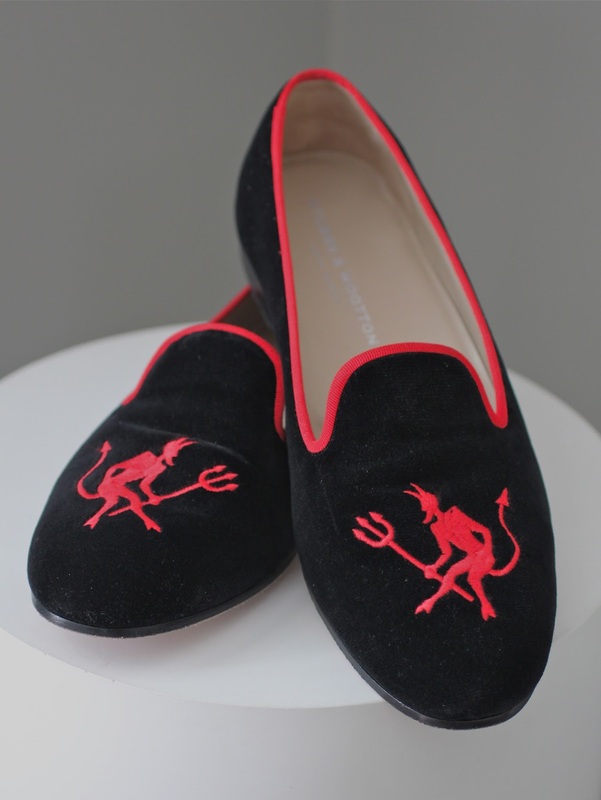 Oh, Those Devilish Velvet Slippers! During our recent holiday on Nantucket, we were fortunate to be visited for several days by our friends Calista and John Littlefield. We're crazy about them. Their visit was a laughter-filled, boozy, uproariously funny jabberfest. I'm still recovering from its merriment. Calista is a great fashion plate and shoe diva, and stepped off the jet that delivered her to the island wearing a pair of classic Stubbs & Wootton black velvet slippers that feature an impish red devil wielding a pitchfork. You know the ones I'm referring to, of course. Apparently Calista's slippers excited rather a lot of comment among the fellow travelers waiting for their luggage after the flight. One fellow said to her that the devil featured on her shoes reminded him of one that appeared years ago on a brand of canned deviled ham that he couldn't remember the name of. None of us could remember it, either, when we spoke about it later that evening over what turned into a veritable waterfall of martinis. 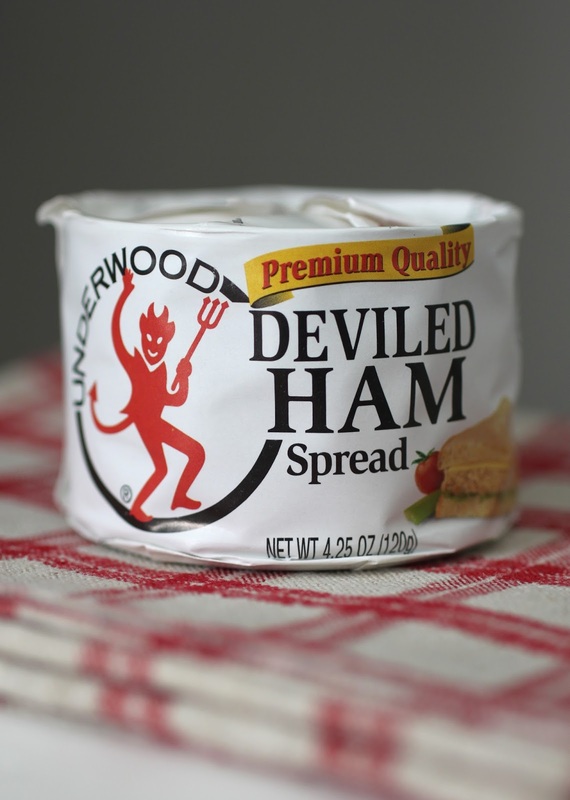 We figured the company that once made the deviled ham had probably long-since dropped its mascot, falling to the pressure of lunatic protesters who threatened a boycott unless the company dispensed with its supposedly Satan-promoting imagery. Reggie has a long personal history with velvet slippers, Dear Reader. He bought his first pair thirty or so years ago at Bergdorf Goodman, long before they became the rage of his lifestyle compatriots on the blogosphere. They were embroidered with a gold threaded fox head. He still owns them. Back in the day Reggie would wear his velvet slippers around the house and to parties, and he sometimes would wear them out dancing in Manhattan's downtown clubs late at night. Most of the time people he came across while wearing them had never seen such a thing, and they almost always had something to say about them, and not always flattering to the wearer. Ah well, ignorance must be bliss . . . or so I've heard. I first became aware of Stubbs & Wootton's velvet slippers a decade or more ago, when I first saw a pair of their devilish slippers on the feet of a man at a black tie party. So clever and so soigné, I thought at the time. I had to have a pair. And so I bought myself some shortly thereafter, and I wear them from time to time, usually at dinner parties or to some festive affair. Unfortunately they are just a wee bit tight on Reggie's feet, and so are strictly party shoes. In July of this year I bought myself another pair of Stubbs & Wootton slippers as a birthday present to myself, made out of midnight blue velvet embroidered with the sun on one of them and the moon on the other. My new slippers fit me better than my devil ones do, and so I've worn them out and about more. So where is all this leading, you may ask? Well, the other day, Dear Reader, while shopping for groceries at a supermarket near Darlington House, I chanced to find myself in the canned meats section of the store, for reasons that are too mundane to go into here right now. On one of the shelves of said supermarket I espied a paper-wrapped, diminutive can of Underwood Deviled Ham, featuring the very same impish red devil found embroidered on Calista's and my Stubbs & Wootton velvet slippers. Eureka! The mystery was solved! How fortunate it is that Underwood still makes its deviled ham, and still features the same red, pitchfork-wielding little devil on its packaging. And how clever and amusing it is that Stubbs & Wootton replicated the little creature on its iconic slippers. How devilicious! I wonder, though, am I the last one in on this particular joke? Better late than never, as they say . . . I have recently returned to my regular, workaday life after spending two supremely pleasant weeks on holiday on Nantucket lolling about and having a delightful time. It was a lovely, restful vacation, Dear Reader, with the added pleasure of meeting new friends and reconnecting with ones of years gone by. I will control my tongue, and will not allow it to speak mean, vulgar or profane words. I will control my temper, and will not get angry when people or things displease me. I will control my thoughts, and will not allow a foolish wish to spoil a wise purpose. What was this about, I wondered? Upon closer inspection I saw that at the bottom of the flag was printed "Inspired by the National Institution of Moral Instruction. Washington, D.C., 1918" and was signed by a certain "Betsy Phmock" in the same handwriting that appeared on the flag. So, what was the National Institution of Moral Instruction? After doing a bit of Internet research I found that it is alive and well today, and is now known as the Character Education Institute. Its mission is to "creatively use every phase of school, family, work and business life to teach and learn values," citing Theodore Roosevelt's statement as its inspiration that "To educate a person in mind and not in morals is to create a menace to society." The moral instruction movement, I learned, is strongly associated with Horace Mann, the nineteenth-century champion of the common school, and was further popularized around the time the framed flag was made in the then-widely-read McGuffey Readers children's books that promoted virtues of thrift, honesty, piety, and punctuality, among others admirable traits. As far as I'm concerned, Dear Reader, we as a people here in these United States would be far better off today if such "virtues" were as valued and promoted as they were one hundred years ago, when Betsy Phmock embellished the little flag that inspired this post . 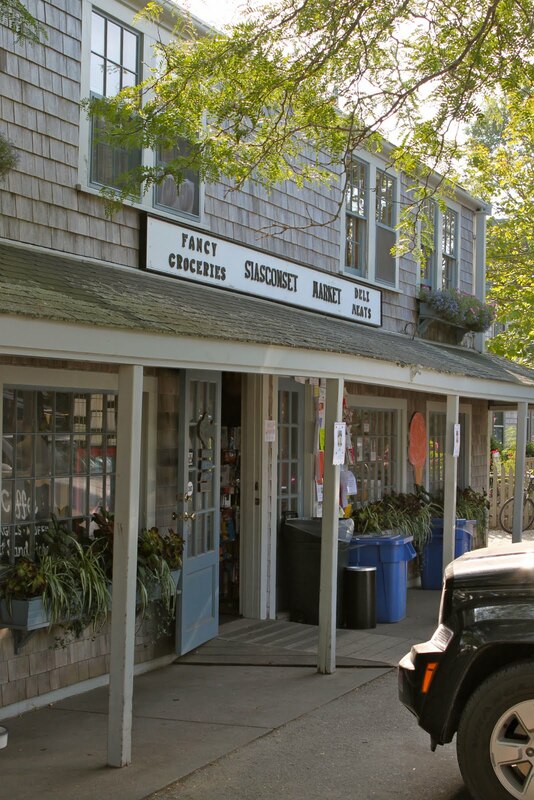 . .
Today I am reissuing a post that I put up several years ago about finding a bottle of salad dressing in the Siaconset Market on Nantucket from the legendary Pine Club of Dayton, Ohio. 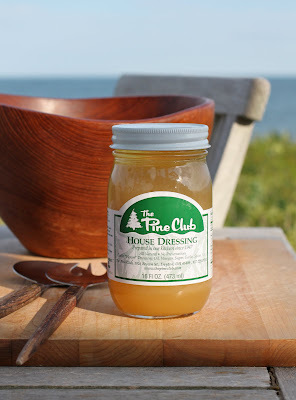 I'm back on island for several weeks again this August, and was delighted to find the Pine Club's salad dressing is still stocked on the market's shelves. I've been enjoying its tasty tangyness almost daily ever since. 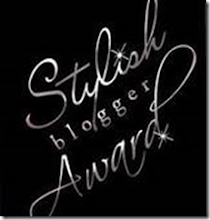 Here's my original post about it, which I hope you like, Dear Reader. The other day I made a late-afternoon trip to the Siasconset Market here on Nantucket to pick up some last-minute supplies for dinner. It's much closer to where we are staying on the island and more convenient for a quick visit than the Stop & Shop (for supermarket staples) or Bartlett's Farm (for heirloom vegetables and best-quality comestibles). While I've shopped at these latter two grocers during our visit (Bartlett's has been an almost daily destination), they are too long a distance for a quick run. Well, about as much of a distance as one can experience on an island as modestly sized as Nantucket. The Siasconset Market is a remarkable little store. For the uninitiated, one would think it would be an unlikely source for a good selection of "gourmet" groceries. First of all, it's tiny. And second, it's rather remote, far away from the hustle and bustle of mid-island. 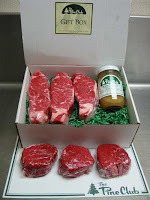 But when one examines what the Market has to offer, one is pleased to find a highly focused selection of edibles and household items that belie a razor-sharp understanding of the Market's affluent, WASPy clientele. 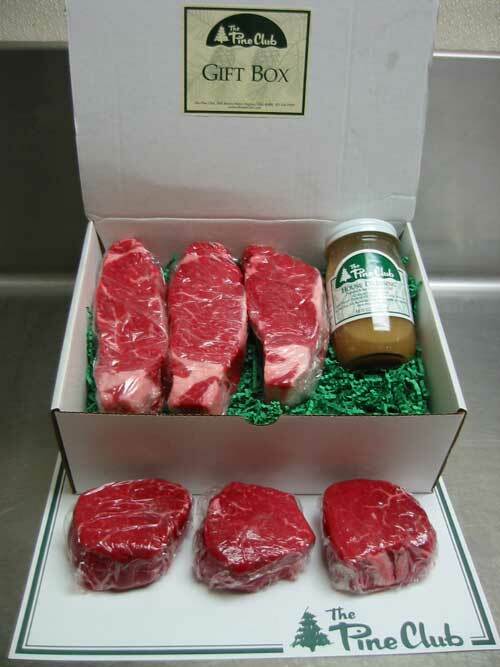 Words cannot express my delight during a recent visit to the Market at coming across a bottle of house salad dressing from the Pine Club, of Dayton, Ohio. Yes, Dear Reader, you read that correctly. I'm talking jarred salad dressing! At first I was drawn to the bottle by its charmingly retro-looking label, thinking "Oh, that looks worth checking out." But when I stopped to examine it more closely I was surprised to see that the Pine Club referred to on the bottle was none other than a restaurant by that name where I spent several memorable evenings almost twenty years ago, when I visited Dayton on business. I have thought of the Pine Club fondly ever since, longing to visit it again. But Reggie hasn't found himself anywhere near Dayton in the intervening years, nor has he figured out a sufficiently suitable justification for going there, except to return to the Pine Club for another splendid meal. As I drove back to our house I wondered, how did a jarred salad dressing from a restaurant in Dayton, Ohio, make its way to the shelves of the Siasconset Market, nearly a thousand miles away? And then I pieced it together . . .
At the time I visited Dayton I was working as a bond analyst at one of the major rating agencies, where one of my colleagues was a fellow named George M. I liked George, and he and I shared a love of eating in still-vital old-line restaurants, as well as a fondness for the island of Nantucket. 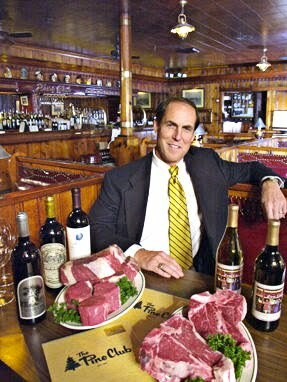 When George learned that I would be traveling to Dayton on business, he said that I should be sure to have dinner one night at the Pine Club, a beloved old-time steakhouse in the city, known for its delicious aged steaks and chops and a knotty pine interior unchanged since the late 1940s. It turned out that the Pine Club was owned by a friend of George's named Dave Hulme who had bought the restaurant a decade beforehand, intending--among other things--to preserve its old-fashioned roadhouse charm. Dave owned a house on Nantucket, too, and George would regularly visit him there during the summer to play golf, and Dave would sing the praises of his restaurant as they traversed the links. As can be seen in the photograph, above, the Pine Club derives its name from its entirely wood-paneled interior (walls and ceilings), dating from the 1940s. It is regularly voted the best steakhouse in Dayton, standing head and shoulders above its rivals, and it serves a menu that its original patrons would likely recognize. Even though almost twenty years have passed, I vividly recall entering the restaurant for the first time and being thrilled to see its knotty pine interior lighted with table lamps and filled with banquettes upholstered in red vinyl. I was quite happy to be seated at a table in the middle of the main room, where a waitress delivered a relish plate (Heaven!) and a basket of hot dinner rolls while taking our drinks order ("Make mine a highball, please!"). After starting with a classic iceberg-lettuce-and-blue-cheese salad dressed with the restaurant's tangy and sweet house dressing, I and my happy dinner companion polished off perfectly cooked, juicy strip steaks served with sour-cream-smothered baked potatoes and the restaurant's delicious signature stewed tomatoes. I don't recall what I had for dessert, but I do remember that we had to pay for our meal with cash, as the Pine Club didn't accept credit cards. It still doesn't. To this day its customers must pay with either cash or sign under a house account. 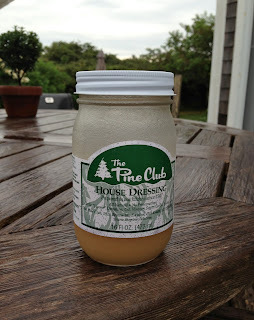 So I figured out that the reason I stumbled across the Pine Club salad dressing on the Siasconset Market's shelves was because David Hulme likely still owned a house nearby and had talked the owners of the Market in to stocking his product, and they must have obliged because he was probably a regular customer. And the Pine Club's dressing had to be a good, steady seller there, too, given the Market's clientele. While not exactly an earth-shattering connection to work my way through, it was a pleasant puzzle nonetheless. And that's how I came to find a jar of the Pine Club's house salad dressing at the Siasconset Market on Nantucket. I happily brought one home with me in the L.L. Bean Boat and Tote bag that I use when out shopping, and Boy and I enjoyed it that evening at dinner sitting on our deck overlooking the ocean. While Reggie is not ordinarily a fan of prepared salad dressings, the Pine Club's is really quite delicious, and he highly recommends it. 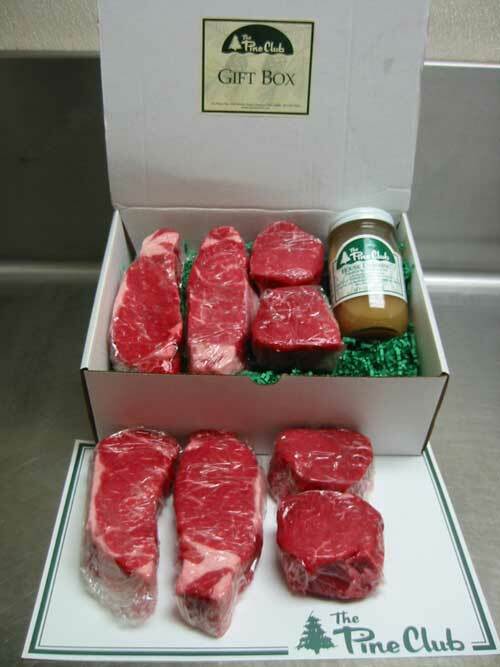 You, too, can own the restaurant's salad dressing, along with its steaks and stewed tomatoes, since--as I learned when researching this essay--the Pine Club will be more than happy to ship its justifiably-famous delicacies to you. I've copied several images of options available for order from the restaurant here in this essay. 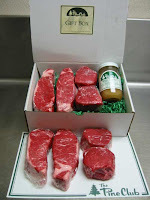 Now that I know the Pine Club does mail order deliveries, I'm planning on ordering some steaks from the restaurant when my Nantucket vacation is over. 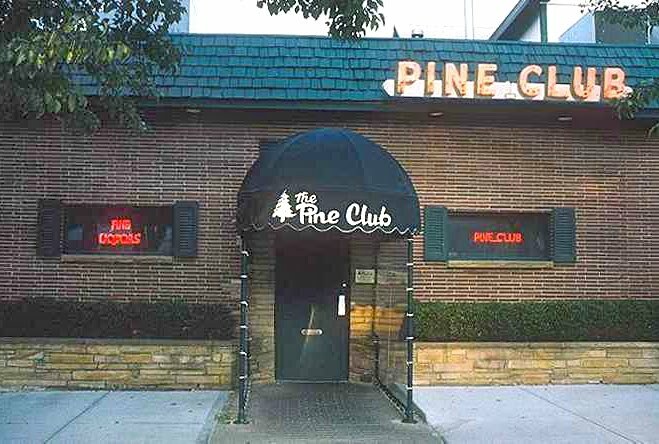 I figure if I can't find my way to the Pine Club any time soon I'm happy for it to find its way to me. Please note, Reggie has received nothing from the Pine Club for his recommendation, except the happy memories of his visits there almost two decades ago, for which he is most grateful.